Created to coincide with our 25th anniversary, the International Day of People with Disability commemorative coin and envelope are now available at participating Australia Post outlets and the Royal Australian Mint. 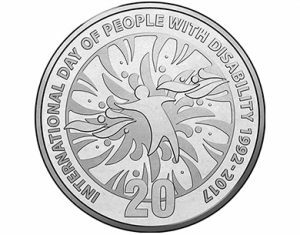 A beautifully designed extension of the International Day of People with Disability logo appears on both 20c coin reverse and pre-paid envelope; which may be purchased together or separately. These unique items are ideal for collectors, gifts for family and friends or simply purchase and use a pre-paid envelope to share the spirit of International Day of People with Disability. Read more about the launch of this exciting initiative.